Over the years, the bathroom has been redesigned, reconfigured, and furnished with luxury amenities to look and feel more like a personal spa, where one can relax, unwind, and be comfortable. 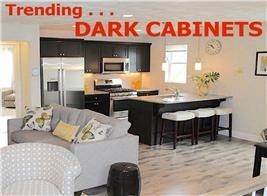 It is – perhaps, next to the kitchen – the most renovated area of the home. Just think of all the modern makeovers in bathrooms – standalone soaking tubs, walk-in showers, colorful tiles, double sinks. And today, another trend – two vanities – continues to fascinate designers and homeowners. No longer just a functional piece of furniture in the bathroom, the vanity – whether split into two distinct units or stretched to form separate dressing/grooming areas with their own mirrors and sinks in one elongated cabinet run – has become the stylish centerpiece of the bath. 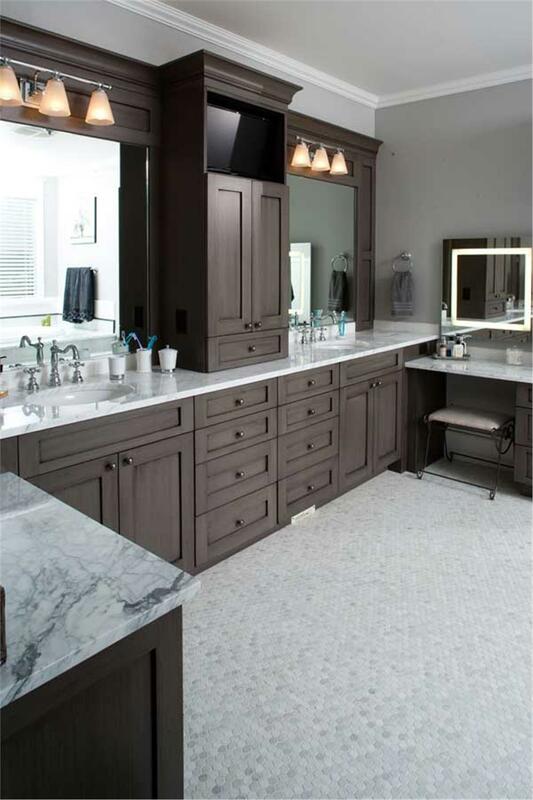 The understated design of this modern bathroom in a 2-story, 4-bedroom Florida style home features two vanity areas with vessel sinks in one long run of cabinets and countertop (Plan #107-1015). If you’re like me and watch a lot of HGTV and the wonders done by the “fixer-uppers” on average homes, you know that a favorite wish list item is a double sink/dual vanity. Even for couples, sharing a sink after a few years presents a few challenges. 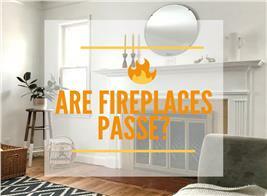 So why stress out about the limited mirror space and “wait time” to get ready in the morning? With a little adjustment, you can have an even better and more stylish design fixture in your bath: the split vanity. 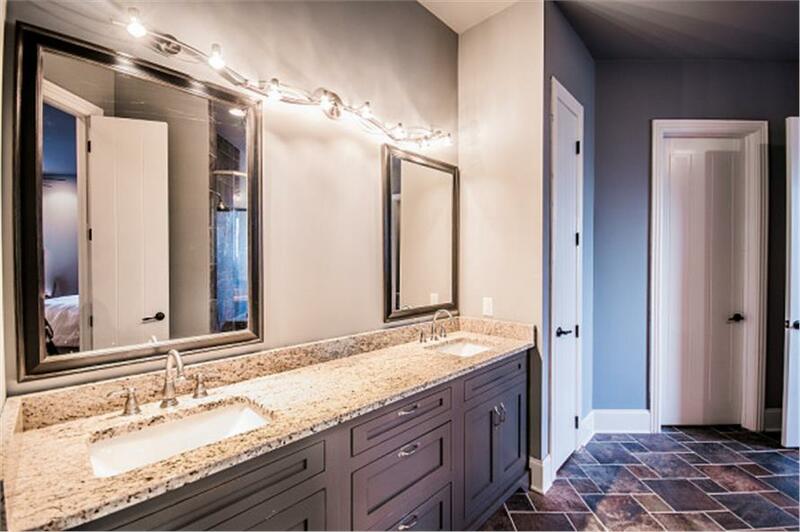 Check out the space in the master bath of a 2-story, 6-bedroom Craftsman-style home with split vanities far enough apart to allow a couple to get ready in the morning without bumping into each other (Plan #161-1044). 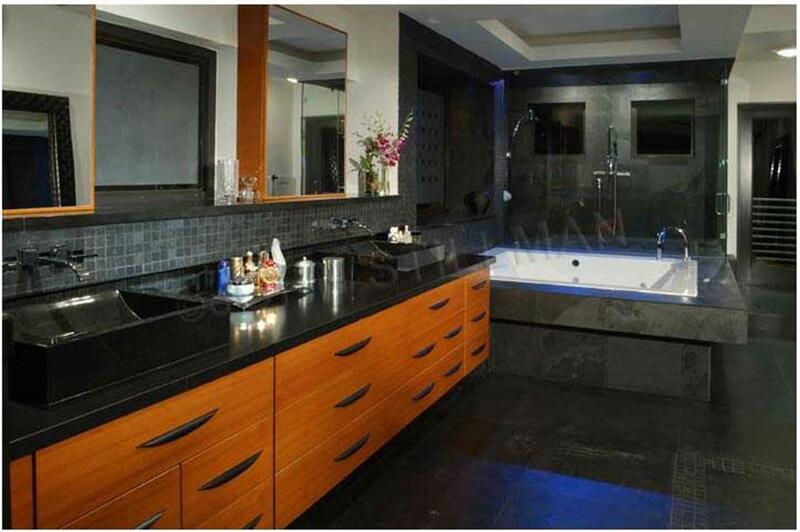 Here’s why the two-vanity design has gained popularity over the past decade – and become a hot trend in home design. Everyone needs much needed space to get ready in the morning. Having two separate and fully furnished vanities provides that personal space – plus storage to organize toiletries and other items. 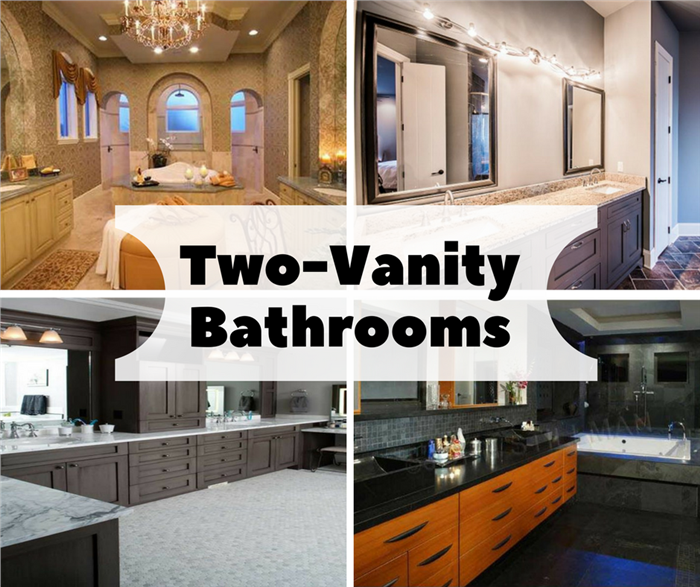 A two-vanity bathroom eliminates “traffic” in the area by allowing couples to move around freely so that they can wash up, shave, apply makeup, brush their teeth, and prepare for their day without feeling rushed. By redesigning the bathroom and installing the split vanity in an area separate from the toilet and shower/tub, you can open up the bathroom and give it a larger and airier look. In addition, big families can increase the usability of the room – with one person using the sink while another is taking a shower. Because the split vanity can be a standalone unit, homeowners can get as creative as they desire when choosing materials, lighting fixtures, and other décor accents. Lastly, the split vanity is a good investment. If you decide to put your home on the market at a future date, it may resell faster at a better price – because of the high demand for homes with two vanities. The master bath in a 3-bedroom Ranch style home – with this streamlined but appealing split vanity with two mirrors and two lavatories – can be an attractive feature for potential home buyers (Plan #106-1281). The vanity is normally the focus of the bathroom, so be sure you choose a design that is fashionable and fits your budget and style. Here are a few configurations to think about that may work for you. Open up the space in a smaller bathroom by using a door to separate the vanities if you prefer two distinct units. You’ll notice that there’s still ample counter space on the vanities – even with the door between them. You can still share counter space and not run into each other by installing a seating area for applying cosmetics, blow-drying your hair, and other necessary preparations in the morning. 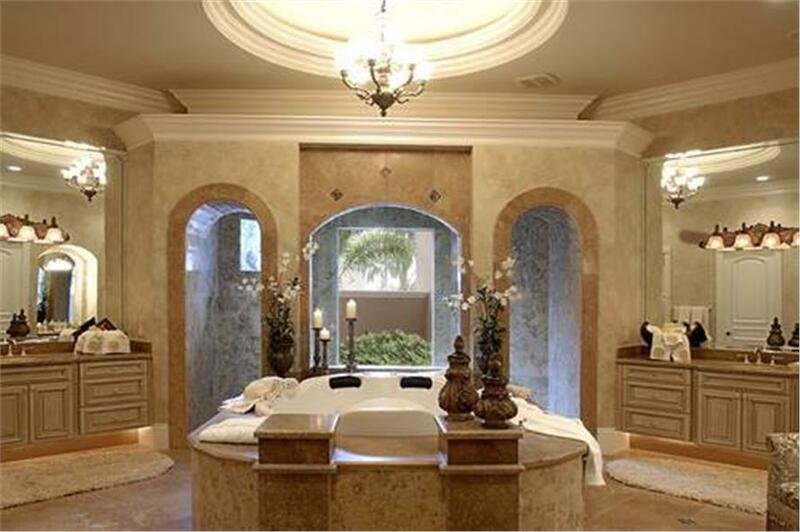 This attractive and spacious master bath in a 2-story, 4-bedroom Tuscan style home comes with a seating area built between the two vanities to separate them (Plan #101-1353). Another option for a shared counter space for the traditional split vanity design is putting a cabinet in between. In addition to providing the necessary personal space, the cabinet makes for extra storage room in the bath. 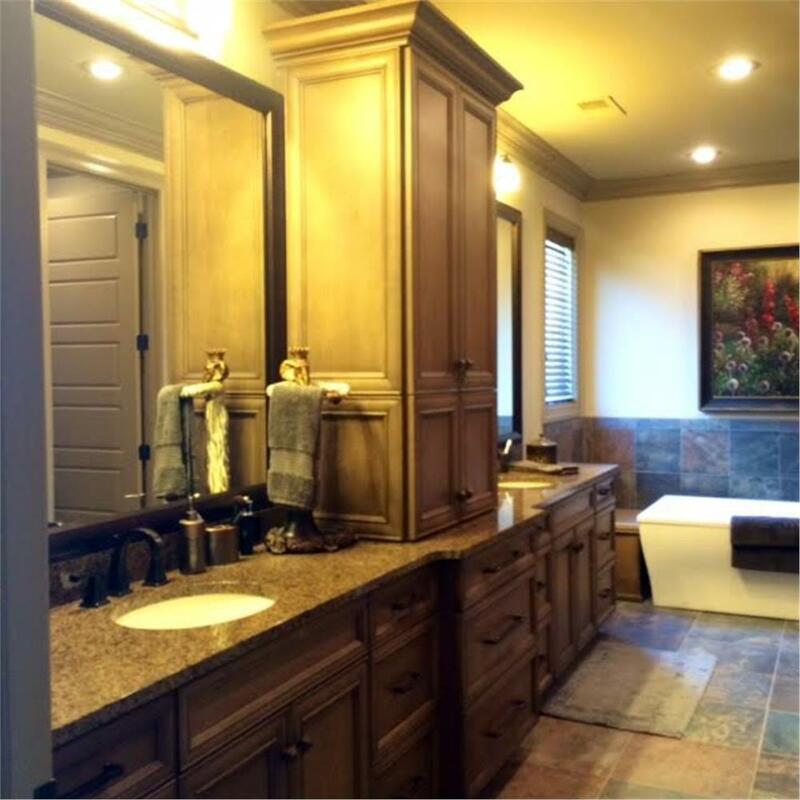 A 1-story, 3-bedroom European style home comes with a master bathroom, which features this split vanity and shared counter space separated by a cabinet (Plan #153-2019). 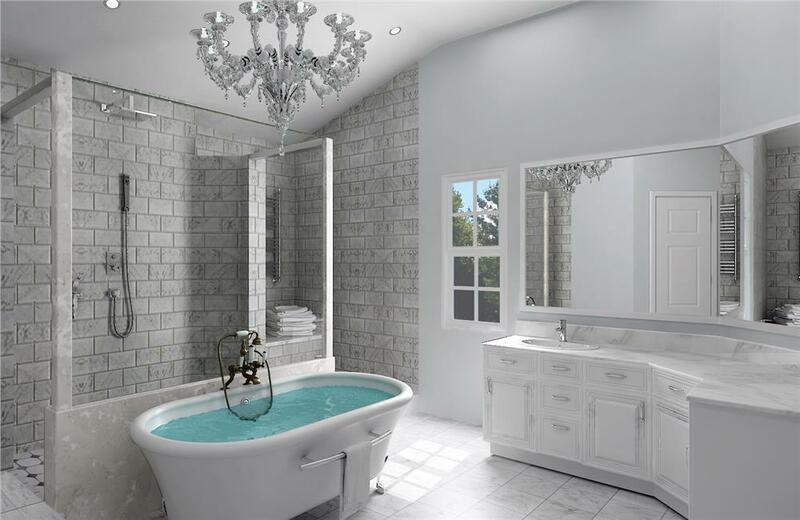 One popular design configuration for master baths in luxury homes is building the tub and shower in the middle of the two vanities – providing easy access to them after a shower or a long, relaxing bath. A Mediterranean style home with 6 bedrooms and 5 full bathrooms outfitted its master bath with these split vanities, which flank the tub and shower (Plan #175-1073). Long before indoor plumbing, there was the bathroom vanity. In its most primitive form, it was just a small table in a bedroom with a pitcher of water and a basin for washing the face and hands. Technology – with inroads into indoor plumbing – and societal pressures for cleanliness and a germ-free environment – led to the “hygienic” bathroom complete with tiles and other hard surfaces. During the Victorian Era, the bathroom was actually an extension of the bedroom as women spent more time there to luxuriate after their baths. While the floors were tiled, there was also carpeting in the bath to complete the relaxing and lush atmosphere. The vanity became a wall-mounted sink with two faucets for hot and cold water – and a drain. It developed from the minimalist and purely functional into a more lavish and expensive fixture with a mirror and cushioned chairs. At the beginning of the 20th century, with indoor plumbing more improved and gaining in popularity, the “vanity” actually became an actual bathroom vanity. It had drawers and cabinets like some of the bedroom furniture in the home. Some of them came with ornate and elaborate woodwork from the Victorian era. 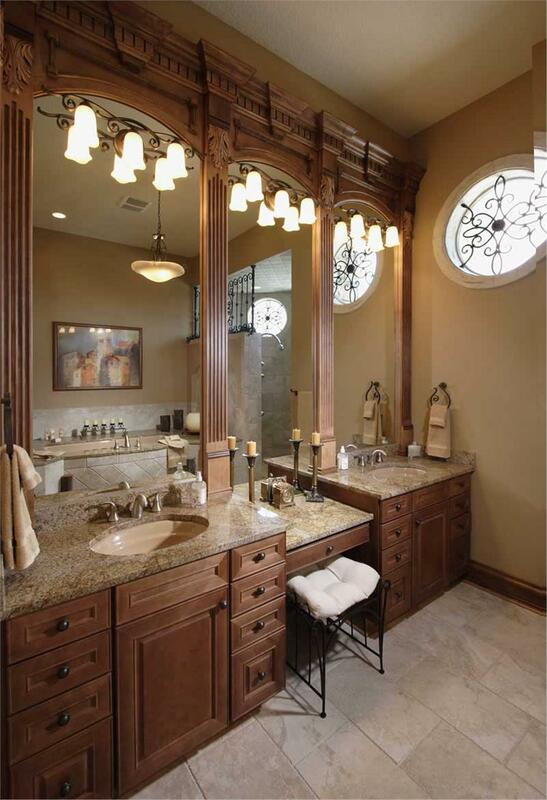 Experts note that this vanity is the first true bathroom vanity as we know it today. Through the years, bathroom vanities reminiscent of the ornate Victorian style were streamlined to be more practical. The elaborate trimmings and embellishments have given way to simple lines that are more casual and comfortable and better suited to the vanity’s function and purpose. Today, the emphasis continues to be on simplicity, comfort, and utility – without sacrificing the attractiveness and appeal of the vanity. 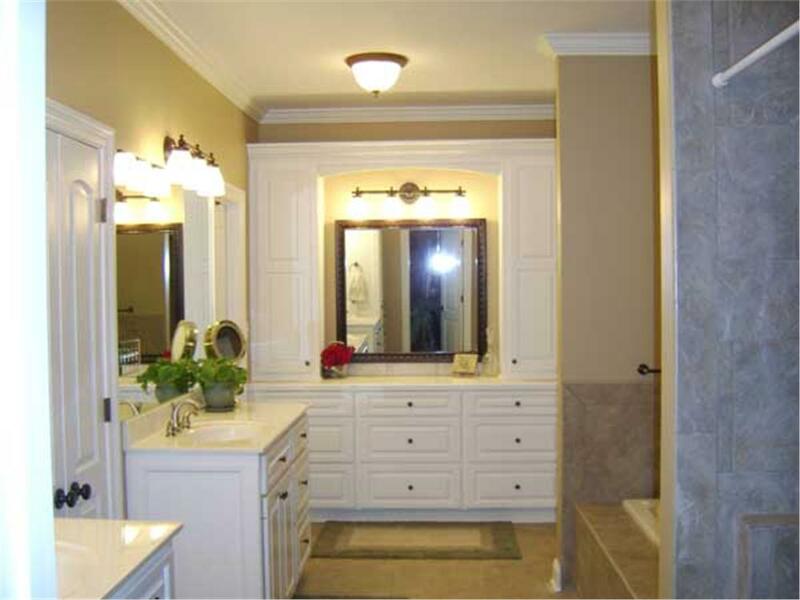 Like the bathroom and kitchen, personal taste dictates the design and lines of the vanity. Simple and minimalist define the design of this vanity in the master bathroom of a 1-story, 3-bedroom luxury style home with Craftsman influences (Plan #106-1315). With all of these designs at your fingertips, isn’t it time to get a split vanity that’s just right for you and reflects your personal style and taste? 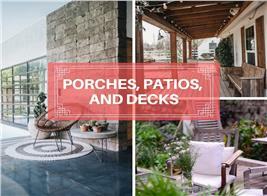 Footnote: The top left photo of the lead image in this article is the master bath of a luxury Mediterranean style home with 4 bedrooms and 4 baths. For more details, click here (House Plan #175-1064).